Yet these stories couldn’t be more different. Confessions of a Little Black Gown takes place over the fortnight of a house party, while Memoirs is just that—the story of Pippin and Dash and the twenty plus years it takes them to find their way to each other. While I love the fast paced romance of Tally and Larken, the poignancy of Pippin and Dash is in the mistakes they make and the heartbreaking choices that leave them separated for so long. To me, this makes their story more real than any other romance I’ve written. When Pippin makes the choices she does in Confessions, when we see the outcome in Memoirs, it is heart wrenching. While some readers felt the pair were cheated by not having their immediate happily ever after, I will stand my ground in the firm belief that in the end, the Pippin and Dash who gain their hearts’ desire will never waste a single moment of that gift. Besides, Memoirs is a good reminder that true love can happen at any time in our lives. Confessions of a Little Black Gown: Read the Excerpt. Order your own copy. Memoirs of a Scandalous Red Dress: Read the Excerpt. Order your own copy. It hangs there to this day. What I love about the full artwork that you don’t really see on the cover of the book are all the wonderful details of this night scene. The carriage, the shadowy street. And just the intimate detail in the clothes. I sort of daydream and crush on it when I look up from writing. And as much as I love the artwork, that is nothing compared to how much I loved writing the Marlowe series (His Mistress by Morning & Tempted by the Night), from the first spark of an idea of a magic ring that grants the wearer one single wish (whether they realize it or not) just seemed filled with possibilities. From Charlotte Wilmont’s wish to be the woman Viscount Trent loved, (and she wakes up the next morning exactly that, the woman he loves with all his heart, except she’s not his wife, but his mistress) to Hermione Marlowe’s wish to go about unseen so she can discover what it is the Earl of Rockhurst does at night. Spoiler: it doesn’t involve a mistress. But poor Hermoine spends a good part of the book invisible. Literally. I actually have about 100 pages of the third book written, but the Marlowes’ stories became victims of shifting reading trends and were sent to the chopping block by a greater power than mine. AKA My Publisher. AKA the people who write the checks. But I hate leaving these stories hanging–so one of these days I am going to find a way to finish this series. Did you read the Marlowe series? Did you love or hate the paranormal elements? Read the Excerpts from Tempted by the Night or His Mistress by Morning. 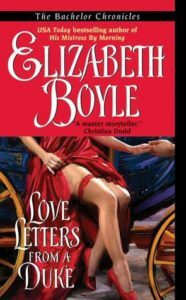 I’m combining #8 (HIS MISTRESS BY MORNING) and #9 (LOVE LETTERS FROM A DUKE) into one post because they actually fit into a category that I like to call: Two Covers that Make Me Cringe. Sometimes the cover goddesses are overly generous (think The Knave of Hearts, Along Came a Duke, Memoirs of a Scandalous Red Dress, or Tempted by the Night)-I must admit, I’ve been mostly lucky in the covers that have found their way onto my books. Now, I know there are lots of you who will protest and say that you LOVE these covers, and that is perfectly ok. But the author has such a personal relationship with their book and when the cover doesn’t fit that vision, it is like wearing the wrong color. You know, the yellow or orange that makes you look like an alien. MISS MARY’S WHORISH RETURN TO THE WILD WEST SHOW. I suppose that isn’t so secret now. Someone on one of the blogs very publicly pointed out this white hot mess: My Regency era heroine has a tan line. So I have to assert categorically that there was a very secret and not well publicized tanning salon on Bond Street in 1812. That’s my story and I am sticking with it. More to the point, my dismay with this cover is that while the title is “His Mistess by Morning“, why does my very shy, wallflower, respectable heroine have to be posed with her hand on her hip like she’s trolling for her next John? I would have preferred not. The funny thing is, I love these books. Writing His Mistress by Morning was like a gift from the story gods. The story just poured out. And Love Letters a Duke, well, I’ve never laughed so hard when writing. Felicity Langley is one of my most hilarious heroines–all because she takes herself so seriously. So you decide, wretched covers aside, which is your favorite? From the light hearted fare of SOMETHING ABOUT EMMALINE came my 7th Avon Romance, THIS RAKE OF MINE and my next hero, Mad Jack Tremont. (Yet another exit sign hero–read about that here) But Jack’s story was no comedy and suddenly I found myself writing a very gothic adventure about the dark and mysterious house on the cliff that one shouldn’t go calling at. But knocking on the door is exactly what my heroine does. Miss Jane Porter, (aka Miranda Mabberly) a teacher from the very prestigious Miss Emery’s school is escorting home three students, when inclement weather traps them at Jack’s house, and the arrival uncovers a grand mystery. I used the name of my good friend and great author, Jane Porter as a place holder of sorts for Miranda Mabberly’s alias. I often do that when I need a quick name and can’t think of just the right one–I pull the name of a friend or family member out of thin air and stick it in the manuscript with the intention of changing it later. But in this case, Jane Porter stuck, and it wasn’t until it was too late (the book was about to go to print) that I realized what I had done–or rather forgotten to do, which was rename the alias. So the name stuck and it was, in my humble opinion, a happy accident. The Duke of Parkerton has that right. At least until he meets his own match. THIS RAKE OF MINE was lampooned in the Economist with a warning to gardeners that this was not a story of yard implements. It was also nominated for the Romance Writer’s of America RITA award. And it perennially tops out as one of reader’s favorite reads. Decide for yourself by ordering THIS RAKE OF MINE here. Or just take a quick peek inside at the Excerpt. 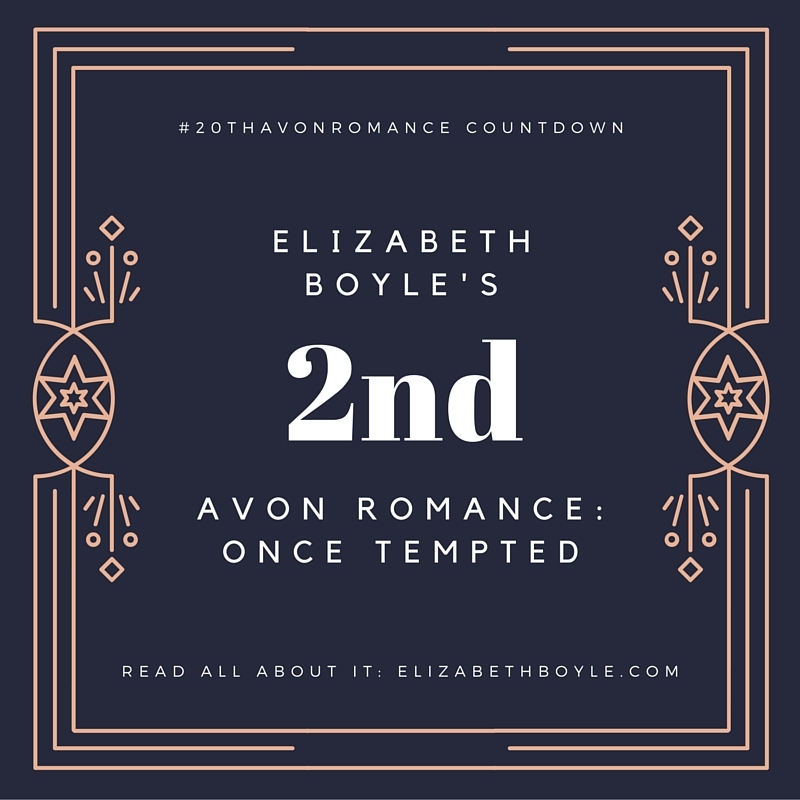 Don’t miss some of the other stories behind my Countdown to My 20th Avon Romance! 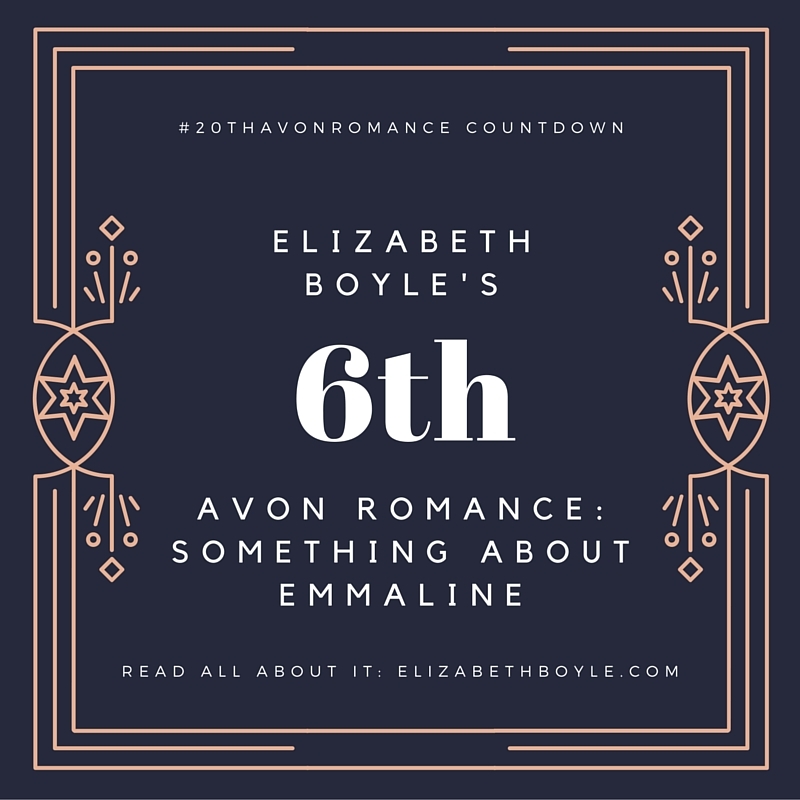 Where do I start with SOMETHING ABOUT EMMALINE, my sixth Avon Romance? One of my favorite of favorites–if authors are allowed such things. I absolutely ADORE this story. But as much as I fell in love with Alex and Emmaline, it is the inspiration that is wild. The spark for SOMETHING ABOUT EMMALINE came from, of all places, an exit sign on State Route 16 in Washington for the following: Sedgwick Rd, Tremont St, and Clifton Rd. Sedgwick, Clifton and Tremont. Those names just haunted me with heroic possibilities. I had to write their stories, and thus began my long-running series, The Bachelor Chronicles. With my hero, Alexander Denford, Baron Sedgwick, in place, I then set out to light a fire under his carefully constructed lies as to having a wife–poor, sickly Emmaline who lived in the country and thus never came to London. Yes, yes, it has a bit of THE IMPORTANCE OF BEING EARNEST, to the plot, but I did it a bit differently by bringing my hero to heel by plopping a living and breathing Emmaline into his well-ordered London life. This is a story of a con gone very wrong and how two people who are entirely wrong for each other fall head over heels in love. I must admit, this book wrote itself–I just delighted in telling Emmaline’s story. So in the odd way of inspiration, my spark from an exit sign turned out to be one of my heartfelt favorites. This is also one of the few books I cried over while writing. The scene where Malvina gives birth and Emmaline has to dig deep to help her friend, cut me to the heart. Also, take a good look at the cover–there is something very wrong with this scene. 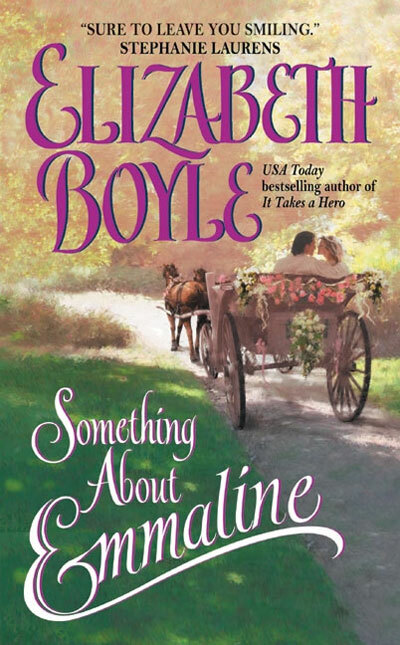 Order links for SOMETHING ABOUT EMMALINE can be found here. Or just take a quick peek inside at the Excerpt. 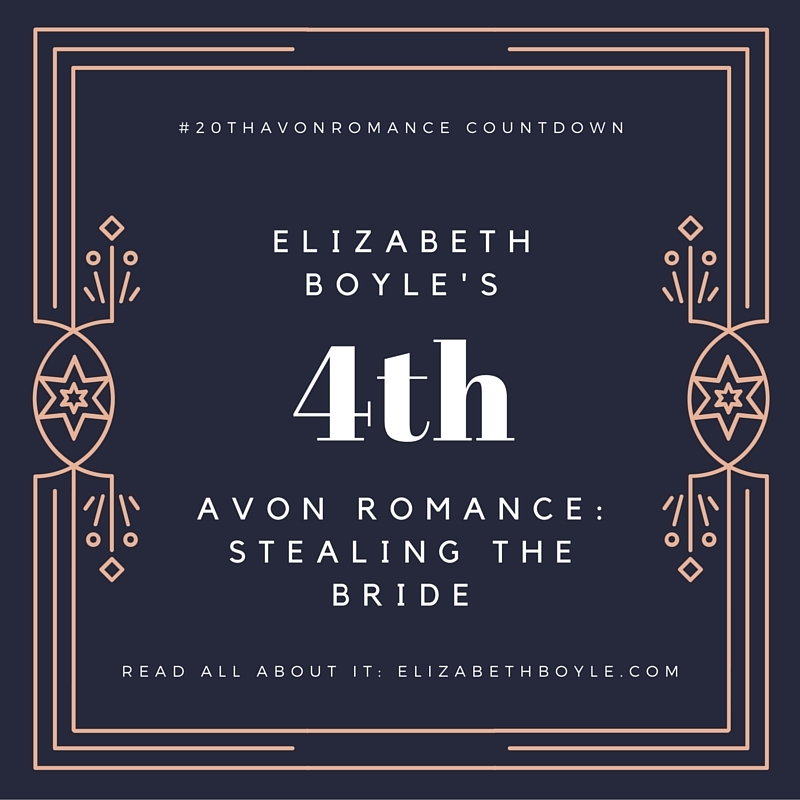 Don’t miss my posts for my 4rd (Stealing the Bride) and 5th (It Takes a Hero) Avon romances. Inspiration comes from every facet of my life. 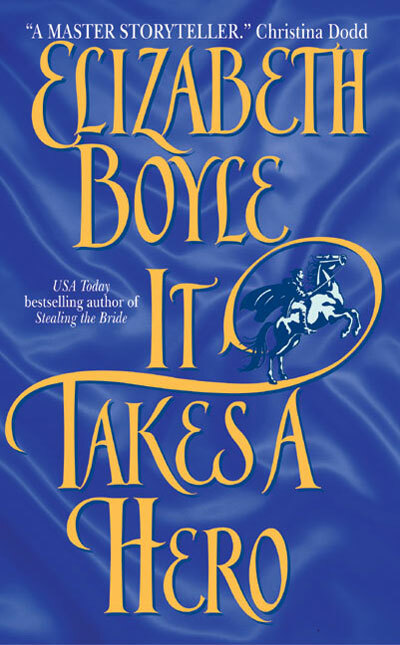 The story behind IT TAKES A HERO (my 5th Avon Romance) came during a family dinner, while listening to my husband’s siblings teasing his unmarried sister about their upcoming visit to Lisdoonvarna in Ireland–an infamous village known for matchmaking. 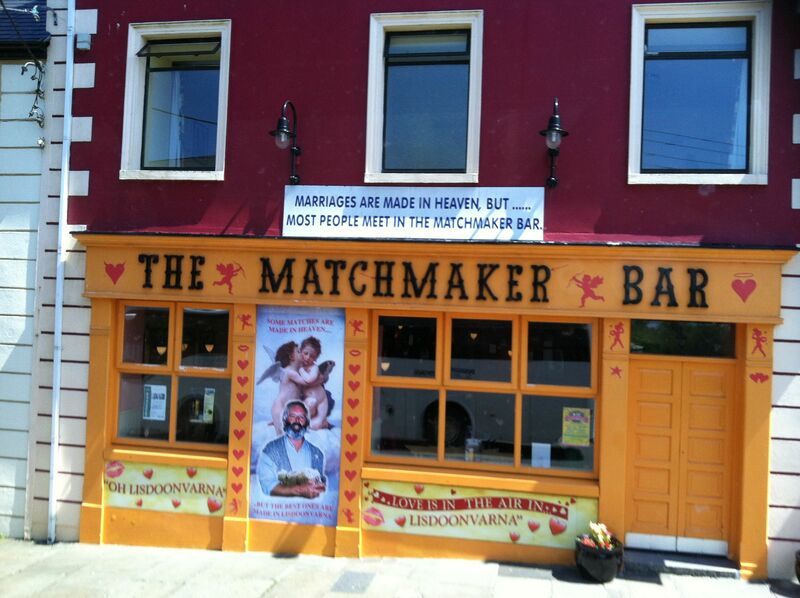 Being a romance writer, what is not to love about a village with a long standing tradition of making happy endings? I was enchanted and story ideas started to bubble around. I just needed a hero and had the perfect one waiting in the wings. The one remaining unmarried Danvers brother, Rafe, who hadn’t a title or money or even the desire to wed.
That is until Rafe is hired to discover and unmask the unknown author of the ruinous Miss Darby novels. The fun part of writing IT TAKES A HERO was then coming up with the outrageous Miss Darby novels that my heroine, Rebecca Tate is guilty of writing. 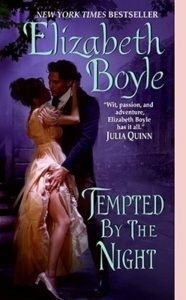 But once I had this list of perilous romantic adventures featuring Miss Darby and the love of her life, Lt. Throckmorten, I couldn’t just let them go after I finished Rafe and Rebecca’s story. No, I kept those books alive and they have been the guilty pleasure of my fictional heroines for years: Thalia Langley, Harriet Hathaway, and my latest pair, the Tempest twins, Louisa and Lavinia, are all mad for Miss Darby. But until then, you will have to be content with the very passionate story of the dark and dangerous hero, Rafe Danvers and the romance novelist, Rebecca Tate, who stole his heart. As I mentioned in my post about my first Avon romance, ONCE TEMPTED, Rafe Danvers is the twin brother of the oft-mentioned, and very dead Orlando Danvers. See here how these two fit into the Danvers’ Family Tree. You can also take a sneak peak inside IT TAKES A HERO or Order your copy. Don’t miss my posts for my 3rd (One Night of Passion) and 4th (Stealing the Bride) Avon romances. I failed to mention in my last post, (about my 3rd Avon Romance, One Night of Passion) that one of my favorite heroes of all time came to life while writing Colin and Georgie’s story. And if you’ve read these books you know I am talking about Temple. Or as he is formally known, the Marquis of Templeton. I’ll never forget that moment. I had written the scene with Colin Danvers being tossed out on his ear by his betrothed, Lady Diana (who has just called off their wedding) and Colin is joined by his cousin, Temple. This rakish, knavish, droll Corinthian stepped off the page and directly into my heart. I literally sat back, sucked in a deep breath and went, “OMG, he’s perfect.” Even authors fall in love. And with Temple, I fell hard. And then as Colin glances over his shoulder for one last look at his former betrothed, he realizes she never loved him, rather she is passionately in love with Temple. Oh, that was a tangle–the sort I love mulling over and coming up with some wild plot to make them both mad–at each other and for each other. Thus was born, STEALING THE BRIDE. And I’ve never been able to let Temple go. He’s appeared in so many of my books, I’ve lost track. Find out how the Marquis of Templeton fits into the Danvers’ Family Tree. 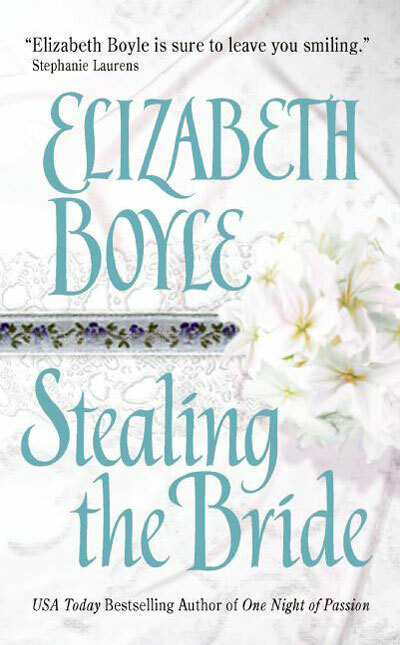 Take a sneak peak and read the Excerpt or order your own Templeton, ur, I mean, your own copy of STEALING THE BRIDE. Don’t miss my posts for my 2nd (Once Tempted) and 3rd (One Night of Passion) Avon romances. For my third Avon Romance in this countdown, I came up with Three Fun Facts You Might Not Know About ONE NIGHT OF PASSION. Honestly, I never thought they would ever use it. I was just being snarky. But they did, and it is still to this day, one of my favorite tag lines. Being a Cinderella story, ONE NIGHT OF PASSION has the lost slipper on the cover. What you might not know is that shoe is the same one worn by my long time editor, Lyssa Keusch, at her wedding. So it is a very lucky shoe indeed. Ironically, I spent 3 months pacing the floor and banging my head against the wall when I got to the scene on the deck of Captain Danver’s ship where he is reunited with the heroine, Georgiana Escott, nearly a year after their fairy tale one night stand. Oh, did I mention that Georgie is holding a baby? Yeah, sort of one of those awkward moments that befuddles even the author who put them there. You’ll have to read the story to see how I resolved that impasse. Find out where Colin and Georgie fit into the Danvers’ Family Tree. Read the Excerpt from ONE NIGHT OF PASSION or just quit dying of curiosity about that one night stand and Order the book. LOL. Read the posts for my 1st (No Marriage of Convenience) and 2nd (Once Tempted) Avon romances. I had no intention of sitting down to write a series when I started ONCE TEMPTED. Yet, as stories often do, the characters blossomed before me and it was the beginning of my love affair with the Danvers family that continues today. 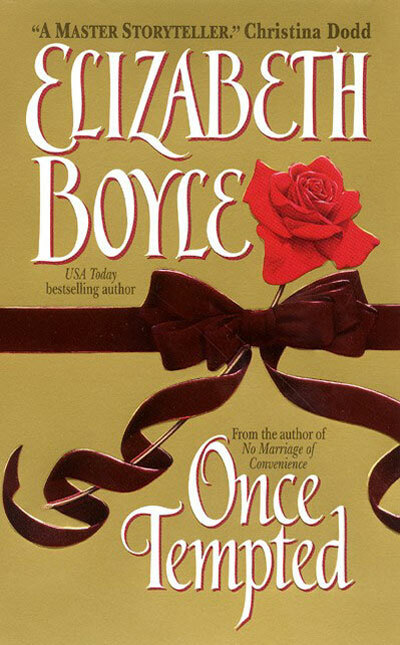 ONCE TEMPTED opens with the death of Orlando Danvers, the youngest of the Danvers brothers. Never have I regretted killing off a character more than shooting Orlando through the heart. Truly, don’t write me, there is no precedent-setting three day Regency operation that will bring him back. And believe me, a lot of you have asked. I have read and reread that opening more times than I can count to see what spark it is that makes so many readers just fall in love with him. Not even writing the story of his twin brother, Rafe Danvers (IT TAKES A HERO) satisfied the Orlando fans. They just wanted him back. So there it is. Orlando is dead, but I think you will find his older brother, Robert, the taciturn, hard-nosed spy determined to avenge his brother’s death and save King and country, just as heroic. Once Tempted also introduces several reoccurring characters who prodded me over the years to let them come back and have yet another moment on the pages. The delightful Jemmy Finch (IT TAKES A HERO, HERO, COME BACK). His gossipy mother, Lady Finch, who appears in nearly every Danvers’ story and even finds her way into The Bachelor Chronicles. She’s a persistent one, Lady Finch. While Once Tempted is listed as the 3rd book in the Danvers series, it is actually the first one I wrote. I then filled in the series with the other titles, all out of sequence. Confused? You aren’t alone. That’s why there is a Danvers Family Tree and Series information so you don’t miss a single story. Order your copy of ONCE TEMPTED, or read the Excerpt. I can’t believe my 20th Avon Romance, THE KNAVE OF HEARTS, is about to arrive! 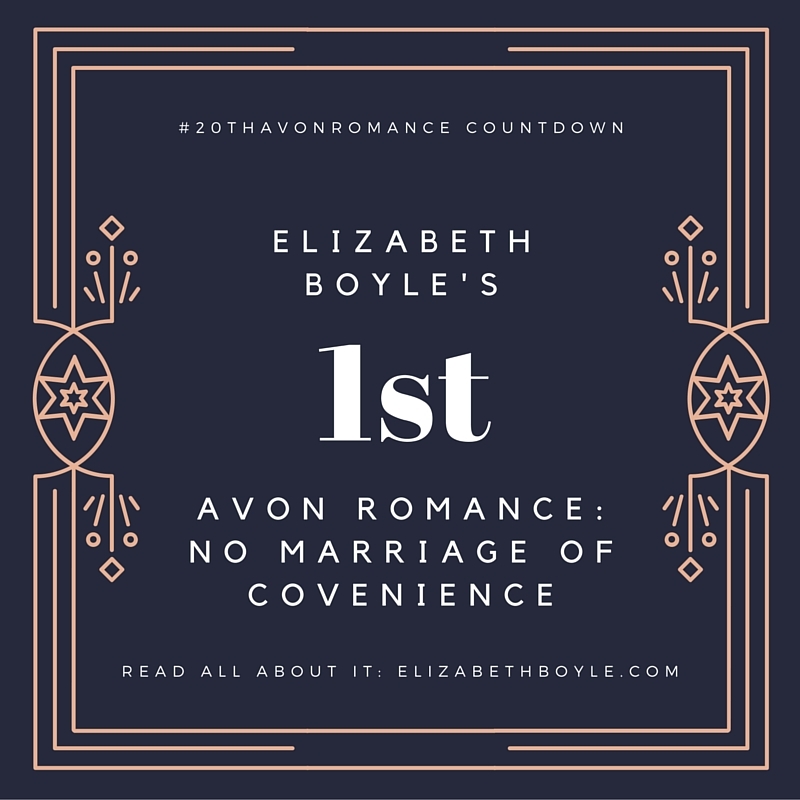 To celebrate this amazing run, I thought it would be fun to countdown all 20 books, starting with my first Avon Romance, NO MARRIAGE OF CONVENIENCE. This book is unique in that it started out as an idea for a follow up book to Brazen trilogy which I had written for Dell Books. But when I was offered the chance to write for Avon (which had been my dream all along) I jumped to write for the house that published Woodiwiss and so many others that I had loved reading. So I refashioned the idea to make it a standalone story about an entirely new set of characters. Riley Fontaine, who had originally been slated to be the long lost love child of Emma Langston, from BRAZEN ANGEL, gained a new mother and heritage, but kept her sassy, unconventional flair. She upends the life of Mason St. Clair, the Earl of Ashlin and in the process helps marry off all three of his spinster nieces. 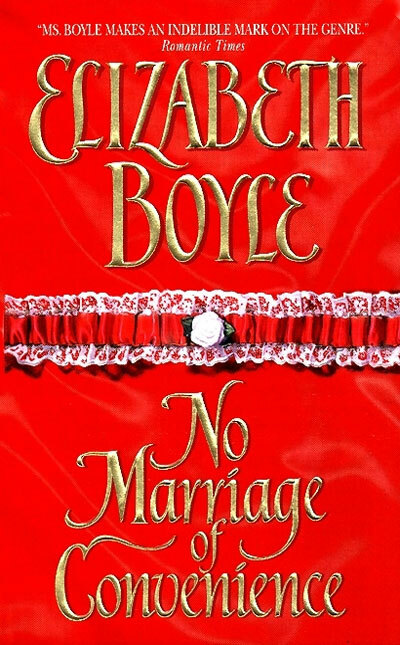 No Marriage of Convenience is also unique in that it is my only standalone story–so if you are looking for a read that won’t entangle or commit you to a long series–here is your story. Order your copy of No Marriage of Convenience, or read the Excerpt.